When my wife’s parents were visiting us from Romania, we wanted to show them some of the natural beauties found locally here in Georgia, USA. Being a little older, long hikes were not really an option for them. The perfect place for a day trip and a short hike is Anna Ruby Falls in the North Georgia mountains. Anna Ruby Falls is located near the Bavarian themed town of Helen, Georgia. This little town is a great place to stop and enjoy an afternoon lunch and to browse the small shops. In the immediate area are several wonderful Georgia State Parks: Unicoi State Park, Smithgall Woods and Vogel State Park. And crossing this entire area is the historic Georgia-to-Maine Appalachian Trail. The Springer Mountain trailhead is only forty miles from Helen. 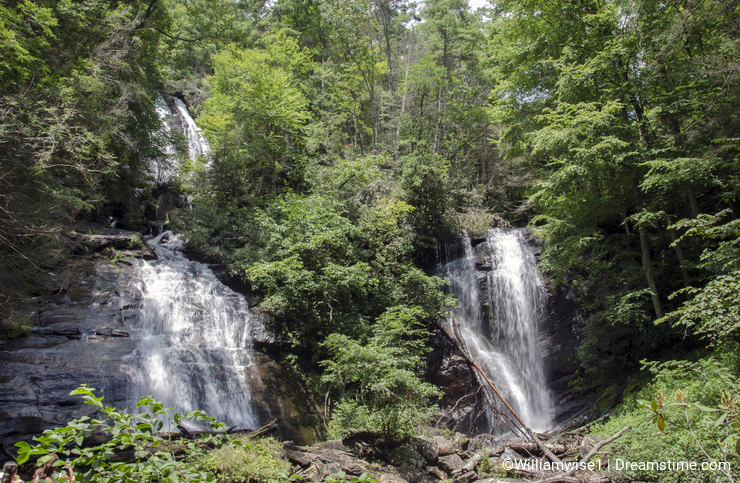 Anna Ruby Falls is a picturesque waterfall nestled within the mountain laurels and rhododendrons. In fact, it is actually a dual waterfall created by two separate streams. Curtis Creek and York Creek join at the base of the falls to form Smith Creek. The hike up to Anna Ruby Falls is a short, paved half-mile; perfect for those with accessibility issues. Yet it still maintains a secluded, peaceful Appalachian mountain appeal. There is also a longer trail for those adventurous types. See Ruby Falls..... Years ago, as a kid going on family vacations travelling north and south to Florida in the car from the midwest we would see endless signs along the freeway saying "See Ruby Falls 340 miles !" .... "See Ruby Falls 290 miles !"... "See Ruby Falls 183 miles !" and the closer we got to Ruby Falls, the more signs there would be. Finally the sign would say "Ruby Falls This Exit ! Dad never did want to see Ruby Falls... so we never did visit this mythical place. Thanks for showing me William !